IndustryBuilt, one of the largest Microsoft Dynamics NAV* partners in North America, provides industry-focused software and services primarily to mid-sized businesses. Its customers... often have the same challenges as larger organizations, without the same resources and with employees often performing multiple duties. The company is comprised of two business groups that each focus on matching the best software technology with the appropriate business processes for each industry. JustFoodERP* helps food companies lower costs, improve food safety, and manage customer compliance. Equip-Soft* helps equipment distributors manage growth and improve efficiencies through its rentals, service, sales, parts, and fleet management software. Limited hardware and management resources. Customers rely heavily on storage- and resource-intensive transactional databases. Intel® Cache Acceleration Software with the Intel® Solid-State Drive DC S3700 Series. IndustryBuilt performed simulation testing of 30 different real-world scenarios before deploying to its customers. Increased performance and reduced latency. Read speeds increased between 11 to 18 times for both IOPS (IO/sec) and throughput (MB/sec), while latency (ms) was reduced by 96 percent. 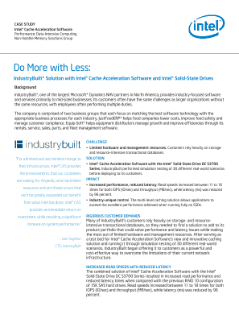 Read the full IndustryBuilt* Solution Does More with Intel® Solid-State Drives Case Study. See how SSD-based enterprise caching software boosts app performance, eliminates I/O bottlenecks. Provides a robust storage optimization platform for IT virtualization in ESG lab validation. Collect real time data without costly redundant infrastructure with Intel® Data Center Manager. The Intel® Data Center Manager provides information that enables the DCM to spot an out-of-range temperature reading. Enable real-time assessment of power margins under impaired circumstances with Intel® Data Center Manager.